We returned from our summer break to the cosy setting of the Black Door club within the Harcourt Hotel. Brian, the Toastmaster for the night got the meeting underway, before passing onto Gerry who was running the Topics. It was a rapid-fire Topics session with Gerry aiming to get everyone up talking. Joe risked arrest when fessing up to having a very a la carte approach to the law. Sarah fleet foot edly evaded a question on which was the most complicated gender by questioning the validity of gender definition itself. Richard had to contend with women’s chat up lines. Deirdre got to have a rant about cyclists. Guest Neil got to tackle “Looks vs Sense of humour” when selecting a mate. He sensibly began by stating that looks were the filter. Indeed. Love me Tinder! Returnee Gemma had to wrestle with the toilet seat. Up or down? It’s these high-brow subjects that drag me out here you know. Merrilyn discussed the phenomenon of Deja Vu, but I’m sure you heard that one before – (I’m here all week). Mark was asked to discuss the important qualities in a relationship and went straight back to the toilet seat. We laughed, until he silenced the room with the sobering tale of how he almost lost his wife to a late night “seat up” toilet accident. Guys, be careful. Too many good women have been lost to the sewers because of our carelessness. Fergal told us he gets excited by Donald Trump and cycling, but not at the same time. And we almost got through the topics sessions without mentioning the D word! We started the new season with 4 speakers chomping at the bit and raring to go. First up was Kieran’s speech “Half Lobster” where he enlightened us on the teachings of the controversial Professor/Psychologist/Author/Public Speaker Jordan Peterson. Kieran certainly did his research, having watched 60hrs of lectures on YouTube so none of us could argue with him. Anyhow, it turns Peterson is perfectly OK and we’ll be inviting him to speak at Vox the next time he is in town (he charges how much? OK, scratch that). Miguel’s speech “My Accent” brought us on an exciting journey from his native Angola, through the Congo, Portugal, Athlone and finally to Dublin. Apparently just speaking French in the DRC can you land in jail for a week before you have to cough up the dough to get out. 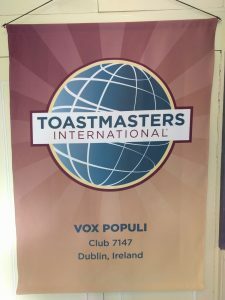 Then we had Deirdre’s speech ”The Cool Club” where she reminisced about her first tentative steps into the world of Toastmasters. She reminded us how the club self-identified as “The coolest club in the world”, until we realised that calling ourselves cool is perhaps not so cool. But she stayed for the friendly and sound people at Vox Populi. Finally Brian gave a humorous speech on the subject of weddings. He had some good advice for being a best man – always avoid the topics of ex-girlfriends and any trips to Amsterdam. Remember that lads. Cogito club guest Michael May was our general evaluator for the evening and he gave us a glowing report. Guests from other clubs are always welcome. 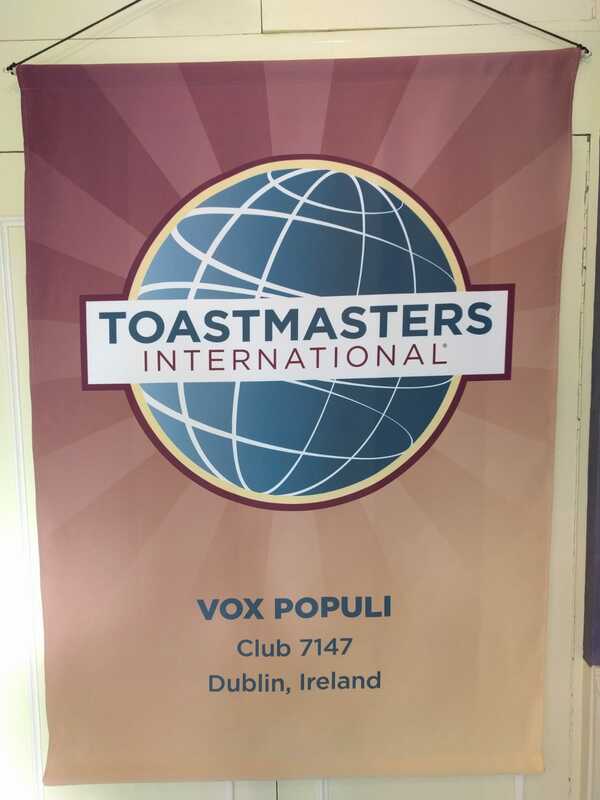 Our next meeting is at 7pm Wednesday September 19th at the Harcourt Hotel. See you there!